It was the columnist Frank Scully who first alerted the world to sensational stories of recovered flying saucers and little Aztec Crash Site Area men in his best-selling book Behind the Flying Saucers published in 1950. Scully claimed that up to that time there had been four such recoveries, one of which was alleged to have taken place around Aztec, New Mexico, when sixteen humanoid bodies were recovered together with their undamaged craft. According to Scully's informants, the disk that landed near Aztec was 99.99 feet in diameter, its exterior made of a light metal resembling aluminum but so durable that no amount of heat (up to 10,000 degrees was applied) or diamond-tipped drill had the slightest effect. The disk apparently incorporated large rings of metal which revolved around a central, stabilized cabin, using an unfamiliar gear ratio. There were no rivets, bolts, screws or signs of welding. Investigators were eventually able to gain entry. Scully was told, because of a fracture in one of the portholes, which they enlarged, revealing a knob inside the cabin which when pushed (with a pole) caused a hidden door to open. Sixteen small humanoids, ranging in height from 36 to 42 inches, were supposedly found dead inside the cabin, their bodies charred to a dark brown color. Scully was told that the craft landed undamaged, having landed under its own guidance. The craft was eventually dismantled, the investigators having discovered that it was manufactured in segments which fitted in grooves and were pinned together around the base. The complete cabin section, measuring 18 feet in diameter was lifted out of the base of the saucer, around which was a gear that fitted a gear on the cabin. These segments, together with the bodies, were then transported to Wright Field (Wright Patterson AFB). Some of the bodies were later dissected and examined by the Air Force, and were found to be similar in all respects to human beings, with the exception of their teeth, which were perfect. According to important information published by William Steinman in 1987 there is a large grain of truth in the Aztec story, and he has managed to acquire some astonishing supportive evidence. Like Scully, he is unwilling to divulge his sources, which inevitably lays him open to charges of fabrication. Steinman discovered that the Aztec disk came to earth on 25 March 1948, having been detected by three separate radar units in the southwest, one of which was said to have disrupted the craft's control mechanism. The area of impact was calculated by triangulation and this information was immediately relayed to Air Defense Command and Gen. George C. Marshall, then Secretary of State, who allegedly contacted the MJ-12 group as well as the Interplanetary Phenomenon Unit (IPU) of the Army Counterintelligence Directorate. The IPU operated out of Camp Hale, Colorado, at this time, Steinman claims, and its main function was to collect and deliver disabled or crashed disks to certain specified secret locations. The craft was recovered within hours by the IPU scout team about 12 miles northeast of ufo landing spotAztec. General Marshall ordered Air Defense Command to go off alert status, and the radar units were advised that there had been a false alarm. Marshall then gave orders to the commander of the IPU to organize a recovery team and contacted Dr. Vannevar Bush - the. head of MJ-12 to gather together a team of scientists to accompany the IPU to the crash site. March 8, 1950--Dayton, Ohio. A round UFO seen by the crew of a TWA airliner, was tracked on radar, and chased by two F-51s. March 10, 1950--Orangeburg, S.C. Disc hovered over city, sped away. 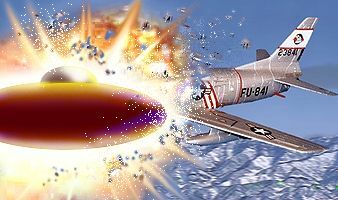 March 13, 1950--Clarksburg, Calif. Saucer-shaped object descended, hovered with swaying motion, moved away. March 13, 1950--Mexico City, Mexico. Airport observers saw 4 UFOs, one through theodolite. March 16, l950--Dallas, Texas. Navy Chief Petty Officer at Naval Air Station saw a flat oval UFO pass under a B-36 bomber. March l7, 195O--Farmington, N. Mex. Retired Army Captain, others, saw dozens of discs gyrating in sky. March 18, 1950--Nr. Bradford, Ill. Private pilot watched illuminated oval pass his plane. March 20, l950--Nr. Little Rock, Ark. Chicago & Southern Airlines pilots watched a circular UFO with "portholes" arc above their plane. March 26, 1950--Reno, Nevada. CAA control tower operator saw maneuvering light source. March 26, 1950--Nr. Washington, D.C. Former Air Force aircraft inspector dove his plane at disc which zoomed up into overcast. Fully half of this town's population still is certain today that it saw space ships or some strange aircraft -- hundreds of them zooming through the skies yesterday. Estimates of the number ranged from & quotes several to more that 500. 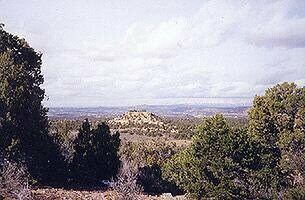 Whatever they were, they caused a major sensation in this community, which lies only 110 air miles northwest of the huge Los Alamos Atomic installation. The objects appeared to play tag high in the air. At times they streaked away at almost unbelievable speeds. One witness did a triangulation sighting on one of the objects and estimated its speed at about 1,000 miles an hour, and estimated its size as approximately twice that of a B-29. Farmington citizens stood in the streets yesterday watching the first reported mass "flying saucer" flight ever sighted. Traffic was slowed to avoid hitting sky gazers. The office of the Farmington Daily Times was deluged with calls from persons who saw the objects. Scores described the objects as silvery discs. A number agreed they saw one that was red in color -- bigger and faster, and apparently the leader. "Moments later there appeared what seemed to be about 500 of them," Boddy continued. He could not estimate their size or speed, but said they appeared to be about 15,000 feet high. Boddy's account was confirmed by Joseph C. and Francis C. Kelloff, retail grocers from Antonito, Colo., who were in Farmington to inspect the site of a proposed new store, and by Bob Foutz and John Burrell of Farmington. The Kelloffs said the objects appeared to be flying in formation. "I'm not a professional engineer," Thatcher said, "but I have engineers working under me and I know how to work out rough triangulation on an object." Thatcher emphatically denied an earlier report that the objects could have been small pieces of cotton fuzz floating in the atmosphere. "It was not cotton," he said, "I saw several pieces of cotton fuzz floating around in the air at the time, but I was not sighting on any cotton." The "cotton" report was started by State Patrolman Andy Andrews, who quoted several Farmington Residents as asserting it was cotton they saw. The residents denied Andrew's report. The first reports of flying saucers were noted a few minutes before 11 a.m. yesterday. For a full hour thereafter people deluged the Times with reports of the objects. A second large scale sighting occurred at 3 p.m. At that time, Mrs. Wilson Jones, 27, and Mr. Roy Hicks, 33, housewives reported seeing objects to the north of Farmington, flying in perfect formation. Others reported the same sight. Johnny Eaton, 29, a real estate and insurance salesman, and Edward Brooks, 24, an employee of the Perry Smoak garage, were the first to report the red-colored sky object. Brooks, a B-29 tail gunner during the war, said he was positive the objects sighted were not airplanes. "The very maneuvering of the things couldn't be that of modern aircraft," he said. John Bloomfield, another employee of Smoak's garage, said the objects he saw traveled at a speed that appeared to him to be about 10 times faster than that of jet planes. In addition, he said the objects frequently made right-angle turns. "They appeared to be coming at each other head-on," he related. "At the last second, one would veer at right angles upward, the other at right angles downward. One saucer would pass another and immediately the one to the rear would zoom into the lead." Marlow Webb, another garage employee, said the objects to the naked eye appeared to be about eight inches in diameter as seen from the ground. He described them as about the size of a dinner plate." "They flew sideways, on edge and at every conceivable angle," he said. "This is what made it easy to determine that they were saucer-shaped." None of the scores of reports told of any vapor trail or engine noise. Nor did anyone report any windows or other markings on the craft. In general Farmington accepted the phenomenon calmly, although it was reported some women employees of a laundry became somewhat panicky. On Feb. 12, 1950 NBC premiered a weekly Sunday afternoon interview series, Today With Mrs. Roosevelt. Her first guests: scientists Albert Einstein and J. Robert Oppenheimer. In March of 1950, Mrs. Roosevelt had as a guest on her program an Arkansas airline pilot who witnessed a flying saucer at close range. Mrs. Roosevelt took his testimony quite seriously. LITTLE ROCK, March 21 -- (AP) -- Arkansas' first flying saucer in nearly three years was reported last night--and by a veteran airline pilot. Capt. Jack Adams of Little Rock, pilot of a Chicago & Southern Airlines plane en route from memphis, Tenn. to Houston, Tex., radioed the C & S operations office here that he had sighted the object near Stuttgart, Ark. On landing here a few minutes later, Adams described the object As circular and "about the size of a DC-3." At Houston Adams said: "The object, I'd judge, was about 1000 feet in front and above us. We were headed almost due west and this object crossed our course from the south. It was headed due north." Adams, who was more than 7000 hours in the air, said the disc Appeared to be about 100 feet in diameter and was traveling at a terrific rate of speed--"500 to 600 miles an hour." "There was a bright white light flashing intermittently from the top of the thing," he said, "and around the edge were what appeared to be ports, something like windows in an airplane.There was a light coming from the ports, but not a bright one." Adams said he saw no vapor trail nor any exhaust flame that might indicate a source of power. It made no noise that he could hear over the sound of his own engines. "I have no idea what it was," he said, "but I'm convinced it was in controlled flight. My guess is that it's something developed either by the Army or Navy." In early March, 1957 four single-seat F-86D Sabre jet fighters were returning from a practice bombing mission on le Shima island off Okinawa in the East China Sea. The jets, in a trail 1/2 mile apart, were flying under a low cloud ceiling at 1,500 feet as they made their landing approach to Okinawa. Without warning, a huge flying saucer with a red-glowing dome dropped directly into the path of the lead jet. The plane slammed into the canopy at the leading edge of the saucer and exploded. Fiery debris rained into the sea below. The saucer, apparently undamaged, hovered momentarily, then lifted up into the clouds and disappeared. 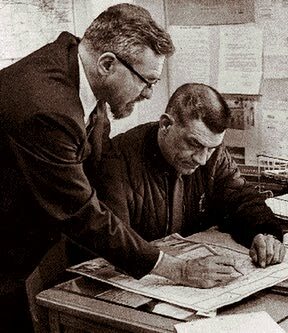 The three surviving pilots gave their reports of the deadly collision and drew pictures of the UFO for Major Rudy Pestalozzi, intelligence officer for the Far Eastern Air Force (FEAF). Pestalozzi included the plots' accounts and drawings in a report to his superiors. 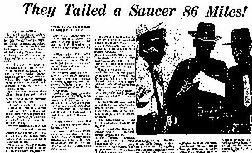 This report, however, may have had any references to flying saucers deleted by General William Hipps, Command General of FEAF, who believed that the air force was wasting its time investigating UFOs. The true content of the report may never be known, as the US Government claims to have no records of this tragic incident, in spite of the testimony to the contrary by both Major Rudy Pestalozzi and the three pilots. March 1959 - London Panics Over UFO/H-Bomb Scare? A London television announcer sent the city into panic when he stated that a UFO was hovering over the city poised to drop an H-Bomb...! 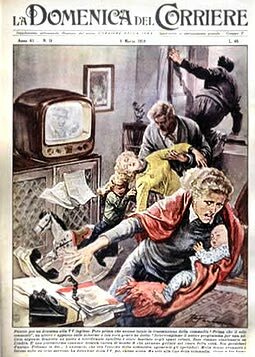 at least according to the Italian magazine 'La Domenica del Corriere' for that year, complete with highly sensational cover graphics. Further information on this event has yet to be uncovered. On the surface it sounds like a pretty inconceivable event, but one never knows. (Britain conducted H-bomb tests at Christmas Island in 1957 two years earlier.) Submissions on this strange story welcome! Backed up by more than 100 witnesses, including William Van Horn, a civil defense director, and dozens of students who watched the football-shaped object for four hours as it maneuvered near the University of Michigan campus, a nearby airport and a local swamp. The March 14 sightings caused an uproar and the area went on a wild UFO chase. Three days later on March 17 two Washtenaw County sheriff's deputies, Sgt. Neil Schneider and Deputy David Fitzpatrick saw three or four red, white and green circular objects oscillating and glowing near Milan about 4 a.m. They called Willow Run Airport officials who could not confirm with radar. Two more Washtenaw deputies, BuFord Bushroe and John Foster tried to follow the same type of objects in the northern part of the county on March 20. Livingston and Monroe county residents also reported seeing the objects. The Detroit News carried the police chase story the next day along with a drawing of a quilted football shaped object with lights, dome and antennae. (It was not maize and blue with a big M on it.) Image Frank Mannor and his son searching the area where the UFO was seen to land. Note the bent grass. Dexter patrolman Robert Huniwell said he spotted an object in the sky at Quigley and Brand roads between 9:30 and 9:45 p.m.. He said the flying object with red and green flashing lights, came close to the ground, hovered above a scout car and was joined by a second vehicle on its ascent. Washtenaw County Sheriff Douglas Harvey ordered all available deputies to the scene. Six patrol cars, two men in each, and three detectives surrounded the area. They later chased a flying object along Island Lake Road without catching it. Frank Mannor and his family saw the lights from their McGuiness Road farm. "I got within 500 yards of that thing and it looked pyramid-shaped. It had a light here and a light there and what looked like a porthole. a road and moving from side to side like this was..."
"It wasn't like the pictures of a flying saucer and it had a coral-like surface. I've trapped every hole in this county and I've never seen anything like it." Mannor said the vehicle, by its own lights, appeared to be the length of a car and had a hazy mist under it as it hung above the ground. Mannor's son, a member of the Dexter High School track team, and Mannor's wife also witnessed the object. It rose up to the tree tops and waited awhile and fell back to the ground. It became different colors, white on the ground, blue, then red in the trees, and then came down and changed colors again. It sounded like a ricochet of a bullet, and like a siren, a real high frequency, they said. Police Chief Robert R. Taylor and Patrolman N.G. Lee came to the farm in response to Mrs. Mannor's call and heard the noise. Washtenaw County Deputy Sheriff BuFord Bushroe also observed it. "It looked like an arc. It was round. We turned around and started following it through Dexter for five miles. It was headed west and we stopped. We lost it in the trees. Either the lights went off or it took off with a tremendous burst of speed. It was about 1,500 feet above the ground. It moved along at about 100 mph. We were doing 70 before losing it near Wylie Road." Carloads of college students from nearby University of Michigan and Eastern Michigan University converged on the area after hearing radio reports of the sightings. Mannor was asked if it could have been a college prank. He vigorously denied the possibility. "They couldn't rig rigging to it. There was not anything there, There was no way in the world to get out. There were two scout cars on the hill and more at the house." "I know every pothole in this county," he said. "I've never seen anything like it. There's nothing wrong with my eyes and my son has 20/20 vision. We both can't be wrong." "My wife says we'll move out of here," he said. "She doesn't like that. I never lock the doors. Nobody ever bothers us." An Adrian College professor offered the theory that northern lights may be the objects the deputies tried to chase. On March 22 dozens of residents of Dexter and Hillsdale reported more flying objects emitting strange sounds and lights. UFO Demonstrates Power To Disable Missles! In central Montana, Thursday morning March 16 1967, Captain Eric Carlson and First Lieutenant. Walt Figel, the Echo-Flight Missile Combat Crew, were below ground in the E-Flight Launch Control Center (LCC) or capsule. The Echo Flight LCC was located between Winfred and Hilger, about fifteen miles north of Lewistown. Missile maintenance crews and security teams were camped out at two of the Launch Facilities (LFs), having performed some work during the previous day and stayed there overnight. During the early morning hours, more than one report came in from the security patrols and maintenance crews that they had seen UFOs. A UFO was reported directly above one of the E-Flight (LF) or silos. It turned out that at least one security policeman was so affected by this encounter that he never again returned to missile security duty. "If THEY can turn them off... THEY can turn them ON!" Around 8:30 a.m., Figel, the Deputy Crew Commander (DMCCC), was briefing the Carlson, the Crew Commander (MCCC), on the flight status when the alarm horn sounded. One of the Minuteman missiles they supervised had gone off alert (become inoperable) It was one of the two sites where maintenance crews had camped out on site. Upset, thinking that the maintenance personnel had failed to notify him as required by procedure when maintenance work is done on a missile, that the missile was going 'off-alert' status, Figel immediately called the missile site. When Figel spoke with the on-site security guard, he reported that they had not yet performed any maintenance that morning. He also stated that a UFO had been hovering over the site. Figel recalls thinking the guard must have been drinking something. However, now other missiles started to go off alert in rapid succession! Within seconds, the entire flight of ten ICBMs was down! All of their missiles reported a "No-Go" condition. One by one across the board, each missile had became inoperable. When the checklist procedure had been completed for each missile site, it was discovered that each of the missiles had gone off alert status due to a Guidance and Control (G&C) System fault. Power had not been lost to the sites; the missiles simply were not operational because, for some unexplainable reason, each of their guidance and control systems had malfunctioned. Two Security Alert Teams (SAT, "strike teams") were dispatched from Echo to those sites where the maintenance crews were present. Figel had not informed the strike teams that one of the on- site guards had reported a UFO. On arrival at the LF's, the SAT reported back to that UFOs had been seen hovering over each of the two sites by all of the maintenance and security personnel present at each site. Captain Don Crawford's crew relieved the Echo Flight crew later that morning. Crawford recalls that both Carlson and Figel were still visibly shaken by what had occurred. Crawford also recalled that the maintenance crews worked on the missiles the entire day and late into the night during his shift to bring them all back on alert. Not only had missiles been lost to our deterrent forces, but had remained out of service for an entire day! Because of this unique incident, as an ex-Missileer describes it: "All Hell broke loose!" Among the many calls to and from the E-Flight LCC one was to the MCCC of Oscar-Flight which links to the equally dramatic story of what happened in another LCC that same morning. The Oscar Flight LCC was located a mile or two south of the town of Roy, about 20 miles southeast of the Echo-Flight LCC. My recollection is that I was on duty as a Deputy Missile Combat Crew Commander below ground in the LCC, during the morning hours of 16 March 1967. Outside, above the subterranean LCC capsule, it was a typical clear, cold Montana night sky; there were a few inches of snow on the ground. Where we were, there were no city lights to detract from the spectacular array of stars, and it was not uncommon to see shooting stars. Montana isn't called "Big Sky Country" for no reason, and Airmen on duty topside probably spent some of their time outside looking up at the stars. It was one of those airmen who first saw what at first appeared to be a star begin to zig-zag across the sky. Then he saw another light do the same thing, and this time it was larger and closer. He asked his Flight Security Controller, (FSC, the Non-Commissioned Officer (NCO) in charge of Launch Control Center site security), to come and take a look. They both stood there watching the lights streak directly above them, stop, change directions at high speed and return overhead. The NCO ran into the building and phoned me at my station in the underground capsule. He reported to me that they had been seeing lights making strange maneuvers over the facility, and that they weren't aircraft. I replied: "Great. You just keep watching them and let me know if they get any closer." I did not take this report seriously and directed him to report back if anything more significant happened. At the time, I believed this first call to be a joke. Still, that sort of behavior was definitely out of character for air security policemen whose communications with us were usually very professional. "Sir, there's one hovering outside the front gate!" "A UFO! It's just sitting there. We're all just looking at it. What do you want us to do?" "What? What does it look like?" "I can't really describe it. It's glowing red. What are we supposed to do?" "Make sure the site is secure and I'll phone the Command Post." "Sir, I have to go now, one of the guys just got injured." Before I could ask about the injury, he was off the line. I immediately went over to my commander, Lt. Fred Meiwald, who was on a scheduled sleep period . I woke him and began to brief him about the phone calls and what was going on topside. In the middle of this conversation, we both heard the first alarm klaxon resound through the confined space of the capsule, and both immediately looked over at the panel of annunciator lights at the Commander's station. A 'No-Go' light and two red security lights were lit indicating problems at one of our missile sites. Fred jumped up to query the system to determine the cause of the problem. Before he could do so, another alarm went off at another site, then another and another simultaneously. Within the next few seconds, we had lost six to eight missiles to a 'No-Go' (inoperable) condition. After reporting this incident to the Command Post, I phoned my security guard. He said that the man who had approached the UFO had not been injured seriously but was being evacuated by helicopter to the base. Once topside, I spoke directly with the security guard about the UFOs. He added that the UFO had a red glow and appeared to be saucer shaped. He repeated that it had been immediately outside the front gate, hovering silently. We sent a security patrol to check our LFs after the shutdown, and they reported sighting another UFO during that patrol. They also lost radio contact with our site immediately after reporting the UFO. When we were relieved by our scheduled replacement crew later that morning. The missiles had still not been brought on line by on-site maintenance teams. Again, UFOs had been sighted by security personnel at or about the time Minuteman Strategic missiles shutdown. Plainly visible was a huge, gunmetal gray football-shaped object that was rocking back and forth, blinding white light emanating from both ends, but it was silent. Then the object began moving, swinging one end toward the shore and descending. The Bakers became frightened, ran back to their car and fled. When they got home, the object was still visible from a window that faced the lake. The object moved out over the ice and continued to descend, with red and blue lights now flashing in sequence along its lower edge. Sheila then called the Eastlake police to report a UFO, and was finally referred to the Coast Guard. At this point Sheila called the Coast Guard, which sent a team to their house to investigate. Seaman James Power and Petty Officer John Knaub arrived towing a Boston Whaler, a seaworthy boat. When Sheila pointed to the main craft and some of the triangular objects still zipping around it, the men drove closer to the lake to investigate, accompanied by the Bakers. At the lakefront they could hear the ice rumbling and roaring. Power and Knaub gave a running report to their base via the two-way radio in their Chevy Suburban on what they were seeing. The window was down, and the Bakers overheard them saying words to the effect, "Be advised the object appears to be landing on the lake...There are other objects moving around it. Be advised these smaller objects are going at high rates of speed. There are no engine noises and they are very, very low." One of the triangles zoomed straight toward the Coast Guard vehicle, a blur of light, then veered east, straight up, and came down beside the parent object. Two witnesses in separate locations also reported seeing the triangles. Suddenly the triangles returned and one by one entered the side of the parent object as it seemed to land on the ice. The ellipse flashed a series of red, blue, and yellow lights, the light emanating from the end of the object turned from white to red, and the triangles re-emerged and hovered above it. The noise from the ice abruptly ceased, and the lights and triangles disappeared. a. 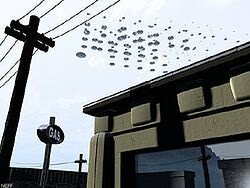 This report gives an overall view of the reports from the concerned Air Force units and of the reports from ocular witnesses of the gendarmerie patrols, about the unknown phenomena watched in the air space (hereafter called UFOs), south of the axis Brussels-Tirlemont, during the night of March 30-31,1990.
b. The observations, visual and radar, were of such a nature that the take off of two F-16 of the 1 J Wing has been decided, in order to identify these UFOs. 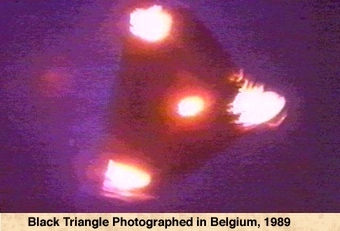 Since the beginning of December 1989, strange phenomena have been regularly noticed in the Belgian air space. The Air Force has at its disposal several ocular witnesses, most of them having been informed by the gendarmerie. The Air Force radar stations could not confirm, in any case, up to March 30-31, these sightings, and the presence of the UFOs could never be established by the fighters sent in that order. The Air Force staff has been able to produce several hypotheses about the origin of these UFOs. The presence or the testing of B-2 or F-117 A (stealth), RPV (Remotely Piloted Vehicles), ULM (Ultra Light Motorised) and AWACS in the Belgian air space during the facts can be excluded. The cabinet of the MLV (Ministery of National Defense) has been informed about these discoveries. In the meantime, the SOBEPS (Societe Belge d'Etude des Phenomenes Spatiaux) got in touch with the MLV, in order that the MLV backed the SOBEPS in its inquiries about this phenomenon. This request has been accepted, and after that the Air Force has regularly cooperated with this society. MDL, who certifies to see, from his home at Ramillies, three unusual lights towards Thorembais-Gembloux. These lights are distinctly more intense than stars and planets, they don't move and are located at the apexes of an equilateral triangle. Their color is changing: red, green and yellow. 23 h 05: The Glons CRC asks the Wavre gendarmerie to send a patrol at this place in order to confirm this sighting. 23 h 10: A new call from Mr. Renkin points out a new phenomenon: three other lights move towards the first triangle. One of these lightsis far brighter than the others. The Glons CRC observes in the meantime an unidentified radar contact, about 5 km north of the Beauvechain airport. The contacts moves at about 25 knots towards west. 23 h 28: A gendarmerie patrol including, among others, Captain Pinson, is on the premises and confirms Mr. Renkin's sightings. Captain Pinson describes the observed phenomenon as follows: the bright points have the dimension of a big star(*); their color changes continually. The prevailing color is red; then it changes itself in blue, green, yellow and white, but not always in the same order. The lights are very clear, as if they were signals: this enables to distinguish them from stars. 23 h 30 - 23 h 45: The three new lights, in the meantime, have drawn closer to the first observed triangle. In their turn, after a series of erratic moves, they arrange themselves also in triangular formation. 23 h 49 - 23 h 59: The Semmerzake TCC/RP (Traffic Center Control/Reporting Post) confirms in its turn to have a clear radar contact at the same position pointed out by the Glons CRC. 23 h 56: After prerequisite coordination with the SOC II, and since all conditions are fulfilled to make the QRA take off, the Glons CRCgives the scramble order to the 1 J Wing. 23 h 45 - 00 h 15: The bright points are still clearly observed from ground. Their respective position does not change. The whole formation seems to move slowly in comparison with the stars. The ocular witnesses on ground notice that the UFOs send from time to time brief and more intense luminous signals. In the mean time, two weaker luminous points are observed towards Eghezee. Those, as the others, have also brief and erratic moves. 00 h 05: Two F-16, QRA of J Wing, AL 17 and AL 23, take off. Between 00 h 07 and 00 h 54, under control of the CRC, on the whole nine interception attempts have been undertaken by the fighters. Theplanes have had, several times, brief radar contacts on the targets designated by the CRC. In three cases, the pilots managed to lock on the target during a few seconds, which, each time, induced a drastic change in the comportment of the UFOs. In no case, the pilots have had a visual contact with the UFOs. 00 h 13: First lock on the target designated by the CRC. Position: "on the nose" 6 NM (Nautical Miles), 9000 feet, direction: 250. The target speed changes within minimum time from 150 to 970 knots, altitude coming down from 9000 to 5000 feet, then up to 11000 feet, and, shortly after, down to ground level. From this results a "break lock" after some seconds, the pilot losing the radar contact. The Glons radar informs, at the moment of the break lock, that the fighters are above the target position. +/- 00 h 19 - 00 h 30: The Semmerzake TCC as well as the Glons CRC have lost contact with the target. From time to time a contact appears in the region, but they are too few to have a clear track. In the meantime, the pilots contact on VHF the radio of the civilian air traffic, in order to coordinate their moves with the Brussels TMA. 00 h 30: AL 17 has a radar contact at 5000 feet, 20 NM away Beauvechain (Nivelles), position 255. The target moves at very high speed (740 knots). The lock on lasts during 6 seconds, and, at the break lock, the signal of a jamming appears on the scope. +/- 00 h 30: The ground witnesses see three times the F-16 pass along. During the third pass, they see the planes turning in circles at the center of the great formation initially seen. At the same time, they notice the disappearance of the little triangle, while the brightest, western point of the big triangle moves very fast, probably up. This point emits intense red signals, in a repetitive way, during the manoeuvre. The two other points of the great triangle disappear shortly after. The clear points above Eghezee are no longer visible, and only the western brightest point of the triangle can be observed. 00 h 32: The Glons and Semmerzake radars have a contact at 110 / 6 NM away Beauvechain, which heads for Bierset at 7000 feet and high speed. The registered speeds go from 478 to 690 knots. The contact is lost above Bierset. The Maastricht radar control center has had no contact with this UFO. 00 h 39 - 00 h 41: The Glons CRC mentions a possible contact at 10 NM from the planes, altitude 10000 feet. The pilots have a radar contact at 7 NM. Again is noticed an acceleration of the target from 100 to 600 knots. The lock on lasts only a few seconds, and the planes as well as the CRC lose the contact. 00 h 47: The Beauvechain RAPCON mentions a contact on its radar, at 6500 feet altitude, position away Beauvechain: 160 / 5 NM. The GlonsCRC has also a contact on the same position. This one is observed up to 00 h 56. 00 h 45 - 01 h 00: Some attempts are undertaken in order to intercept the UFOs. The planes register only a few very short radar contacts. The ground observers see the last UFO disappear towards Louvain-la-Neuve (NNW). 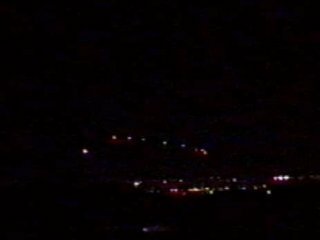 Around 01 h 00, the UFO has completely disappeared. 01 h 02: AL 17 and AL 23 quit the frequency of the Glons CRC and go back to their base. 01 h 06: The Jodoigne gendarmerie mentions to the Glons CRC that has just been observed a phenomenon like the one observed by Mr. Renkin at 23 h 15. 01 h 18: Captain Pinson, who in the meantime has gone to the Jodoigne gendarmerie, describes his observation as follows: four luminous white points at the apexes of a square, the center of which is Jodoigne. The UFO seen towards Orp-Jauche (SW of Jodoigne) is the brightest and has a yellow-red color. The luminous points move with jerky and short moves. +/- 01 h 30: The UFOs lose their luminosity and seem to disappear in four distinct directions. Visibility: 8 to 15 km with clear sky. Wind at 10000 feet: 50/60 knots. A slight temperature inversion at ground, and another, as slight, at 3000 feet. These data are confirmed in Captain Pinson's report. He mentions also that the stars were clearly visible. b. Because of lack of appropriate material, the ground observers could not make any photo or film of the phenomenon. c. The UFO observed with a telescope is described as follows: a kind of sphere, a part of which is very luminous; a triangular shape could also be distinguished (For a more detailed observation, see Captain Pinson's report, in appendix H1). a. In contradiction with other pointed out UFO sightings, for the first time a radar contact has been positively observed, in corrrelation with different sensors of the Air Force (CRC, TCC, RAPCON, EBBE and F-16 radar), and this in the same area as visual observations. This has to be explained by the fact that the March 30-31 UFOs have been noticed at +/- 10000 feet altitude, whereas in the former cases there was always talk of visual contacts at very low altitude. b. The visual evidences, on which this report is partially based, come from gendarmes in duty, whose objectivity cannot be questioned. c. The UFOs, as soon as seen by the F-16 radar in the "Target Track" mode (after interception), have drastically changed their parameters. The speeds measured at that time and the altitude shifts exclude the hypothesis according to which planes could be mistaken for the oberved UFOs. The slow moves during the other phases differ also from the moves of planes. d. The fighter pilots never have had visual contact with the UFOs. This can be explained by the changes of luminous intensity, and even the disappearance of the UFOs, when the F-16 arrived in the neighborhood of the place where they were observed from the ground. e. The hypothesis according to which it was an optical illusion, a mistake for planets, or any other meteorological phenomenon, is in contradiction with the radar observations, especially the 10000 feet altitude and the geometrical position of the UFOs between themselves. The geometrical formation tends to prove a program. f. The first observation of the slow motion of the UFOs has been made roughly in the same direction and with the same speed as the wind. The direction differs by 30 degrees from the direction of the wind (260 degrees instead of 230 degrees). The hypothesis of sounding balloons is very improbable. The UFOs altitude during all this phase remained 10000 feet, whereas the sounding balloons go on higher and higher, up to burst at around 100000 feet. It is difficult to explain the bright lights and changes of color with such balloons. It is very improbable that balloons stay at the same altitude during more than one hour, while keeping the same position between themselves. In Belgium, during the radar observation, there was no meteorological inversion in progress. The hypothesis according to which it could be other balloons must be absolutely dismissed. g. Though speeds greater than the sound barrier have been measured several times, not any bang has been noticed. Here also, no explanation can be given. h. Though the different ground witnesses have effectively pointed out eight points in the sky, the radars have registered only one contact at the same time. The points have been seen at a distance one from another sufficient for them to be distinguished by the radarsalso. i. The hypothesis of air phenomena resulting from projection of holograms(*) must be excluded too: the laser projectors should have been normally observed by the pilots on flight. Moreover, the hologram cannot be detected by radar, and a laser projection can be seen only if there is a screen, like clouds for example. Here, the sky was clear, and there was no significant temperature inversion. 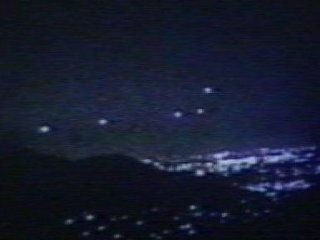 When one hears "the Phoenix Lights" almost everyone generally has one image in mind and one idea; 7 to 9 intensely bright balls of light forming a slight "V" shape in the night sky over Phoenix, Arizona on the evening of March 13, 1997. That night dozens of video-cam operators and thousands of Phoenix residents witnessed the appearing and disappearing of brilliant UFO(s) which hovered over the city just beyond the Estrella mountain range, a spectacle so astonishing that even the national news could not cover it up or blow it off as a flock of geese or mere space debris re-entry. But did you know that video footage was shot earlier that same day, in roughly the same location, of equally bright, glowing objects over Phoenix? While the military attempted to scrub the UFO story in the days following the event with claims of flares being dropped by nearby Luke Air Force Base, Jeff Willes, a Phoenix resident and UFO hunter, knew better. He had videotaped the same intensely bright objects hovering and maneuvering over Phoenix earlier that same day -- these were definitely not flares! (Jeff says that night he did indeed see flares, so he saw the two different lights and doesn't believe they are the same thing. His video more than proves this fact). Local FOX 10 affiliate put Jeff's footage and story on the air, interviewing Jeff and featuring the night-time Phoenix light footage as well. Remarkably, FOX 10 didn't try to make Jeff look like a nutball, or dismiss the UFO sightings, but presented a curious, journalistically sound exposé on the anomalous event. I guess it's a little hard to pan a story that so many thousands of other credible witnesses also experienced, but this was unusually friendly television coverage. Perhaps this time, because Jeff was simply not alone -- the whole city of Phoenix were guests to the many sightings -- and his footage provided excellent evidence that turned most of the debunking claims of the night-footage into vapor rather quickly. 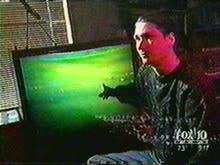 FOX even offered its viewing audience some of Jeff's other remarkable UFO footage, as he spends a lot of time outdoors shooting the skies, watching for UFOs. It has paid off and Jeff has the goods, as we will see. On the 13th of March, Willes was taking his usual video survey of the Phoenix skies when suddenly strange spheres of intensely bright light appeared hovering motionless in the sky. Experienced in shooting UFO footage, Jeff framed the shot with the mountain range for visual reference and several necessary zooms and pans. The orbs of light seem to just dangle there, silently in the cloudy sky, slightly twinkling but by no means strobing, neither did they exhibit any standard FAA flashing lights. As the minutes passed, one of the objects began to slowly move off in another direction until it disappeared beyond the looming cloud bank. The movement was almost imperceptible. The remaining object, still glowing brilliantly then began to move in the same direction and Jeff tailed it steadily with his cam until it, too, moved out of sight, becoming just a tiny glimmer in the distant atmosphere. On Jeff's video, watching the full sequence in fast-forward mode really reveals the remarkable movement of these utterly anomalous objects in the sky, and it becomes abundantly clear they are below the low cloud cover. They very clearly cannot be jets or planes, balloons, ultra-lights, flares, helicopters, stars, planets or swamp gas. The entire taped event lasts approximately 30 minutes. Later that evening, the startling appearance of the 7-9 shining UFOs in the night sky in distinct formation all but serves to verify that what Jeff Willes was shooting in the daylight came back to hover in the same spot, only this time with a few 'friends.' Jeff says those lights were directly over them, while the orbs he shot earlier in the daytime were captured from the mountains west of the city. Willes footage also seems to suggest that the Phoenix lights were not attached to one extremely large object, as some conjecture, but was composed of many individual, glowing UFOs (unless what Jeff captured were merely scout craft for the location for a much larger UFO?). (2) The Night Sightings - The World Was Watching! Most of the controversy that arose from the incident centers around a cluster of lights that was seen, and videotaped, to the south of Phoenix at between 9:30 and 10:00 p.m. on the same night as the sightings. In May 1997, the Public Affairs Office at Luke AFB announced that their personnel had investigated these lights, and had established that they were flares launched from A-10 "Warthog" aircraft over the Gila Bend "Barry M. Goldwater" Firing Range at approximately 10:00 p.m.. Even the most implacable UFO skeptics admit, however, that irrespective of whether such flares had in fact been launched or not, they cannot serve as an explanation for the objects that had been witnessed by many individuals some 1-2 hours earlier. 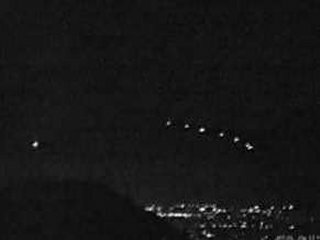 (3) Were the Phoenix Lights Simply Military Flares?